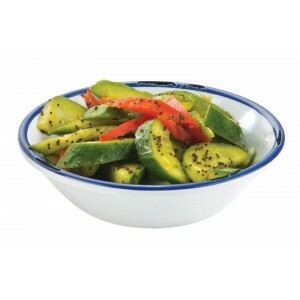 Small Melamine Enamelware Bowls - Cal-Mil Plastic Products Inc. Serve your sides, sauces, or salsas in style with these small bowls! . Constucted of durable melamine, they are functional and easy to clean! Featuring a bright blue edge on the perimeter of the bowls which will complement your food!